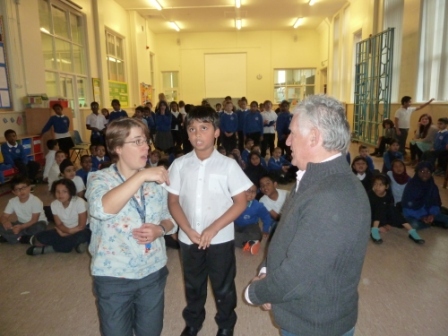 Peter Karrie visited Ninian Park Primary School last week to help students prepare for a special musical production which will be performed in front of family and friends in the school hall on 26th November. Bridgend-born Peter is a renowned musical theatre star and first played the Phantom in Andrew Lloyd-Webber’s record-breaking musical at Her Majesty’s Theatre in London, before going on to play the role in Toronto, Singapore, Hong Kong, Vancouver and the Millennium tour of Great Britain. His performances earned him the title of the ‘World’s Most Popular Phantom’, as voted by the Worldwide Phantom Appreciation Society. 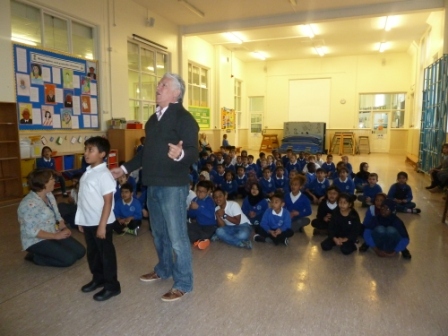 Peter’s experience was evident as he guided school children through renditions of some of the musical theatre favourites including ‘The sun will come out tomorrow’ from Annie, and ‘Close every door’ from Joseph and his amazing Technicolor dreamcoat. Peter, who will be headlining a masquerade ball at Cardiff’s 5* St. David’s Hotel & Spa hotel this New Year’s Eve, does a lot of community-based performances across the UK. He said: “I am passionate about grassroots music and theatre and am always keen to support local initiatives and perform at small, intimate venues. I do a lot of community-based work and visit small theatres and concert halls up and down the country to share my experience and bring the magic of musical theatre to smaller audiences. “It is always inspiring to work with school children and see the amazing enthusiasm and sheer enjoyment music can bring out in them. Musical performance at this local level can provide a great platform for emerging talent and can offer a huge confidence boost for children in expressing themselves.